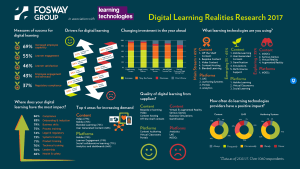 This is a summary of the Digital Learning Realities Research 2017 published from Fosway Group in association with Learning Technologies, on May 23rd. Fosway group is a European independent HR analyst and Learning Technologies it’s Europe’s leading L&D exhibition and conference. As you may guess the research focus is the european market. This report covers the following subjects of Digital Learning: (1) Organization and structure, (2) Digital Learning Teams, (3) Investment. Below are the main points made in each subject. “Digital learning is often a patchwork of learning technologies with little standardisation” (p.3). While the overall analysis show that only the 68% of the respondents report a very and partially standardization approach, when the focus comes to organizations of 10,000-20,000 employees this percentage reaches the 84%! “But, this ability to increase control over digital learning does not scale” (p. 5) and the same percentage for organizations over 20,000 drops to 72%. “Resourcing digital learning varies considerably” (p.6). In organizations lower than 5,000 employees only around a quarter have no digital learning specialist. The corresponding percentage for organizations 5,000-10,000 drops to 10% and for organizations of over 20,000 employees this percentage drops to 6%. This means that digital learning specialists increase proportionately to the organization size. “There is a massive momentum behind increasing investment in digital learning” (p. 7). Only the 6% of organizations are expecting to decrease investment in digital learning platforms and content over the year ahead. There is an increase investment of around 37% in digital learning services and in outsourcing digital learning team, while an increase investment of around 67% is expected towards the digital learning platforms and content. This is the first out of three reports of the series. The next ones are expected shortly and they will be exploring what’s working (and what’s not working) for L&D buyers, plus a summary of the drivers, measures of success and overall trends in digital learning in 2017. What a great article! I often think Europe leads the way with such e-learning research.